Do you need to organize, transport or store the equipment used to maintain your swimming pool? The SunSplisher Swimming Pool Brush and Net Organizer; Caddy and Tote is a combination holder, hanger, organizer and storage device for swimming pool maintenance equipment such as brushes and nets, as well as other types of pool tools designed to be attached to the end of a swimming pool cleaning pole. This product is very durable. You will not be disappointed with the durable nature of this product. 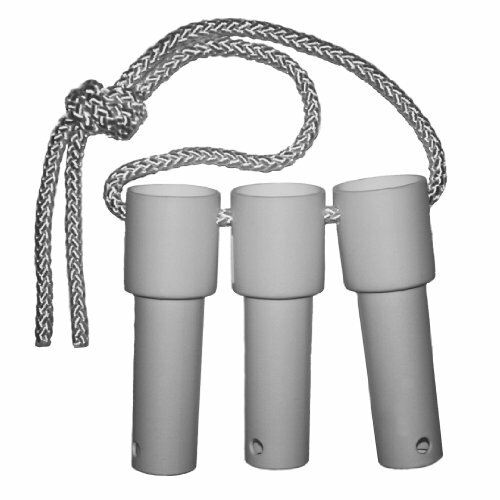 It is made of polypropylene with UV stabilizer (strong plastic) and 5/16" braided nylon rope. Braided nylon rope has a silky feel. The plastic is slightly pliable; it has a very fine texture; and, it is comfortable to touch. Anyone who has a swimming pool needs this product. This product allows the brushes and nets to rotate. This rotation positions the brushes and nets so they are generally parallel and aligned. As a result, the brushes and nets will hang flat and nearly on top of each other. The hook to hang this product is not included. This product is protected by U.S. Patent No. 8,833,717 and 9,182,072. At Last! A great way to organize swimming pool brushes and nets! The brushes and nets hang flat and nearly on top of each other. Made of polypropylene with UV Stabilizer (strong plastic) and 5/16" braided nylon rope. Braided nylon rope has a silky feel. The plastic is slightly pliable; it has a very fine texture; and, it is comfortable to touch. If you have any questions about this product by SunSplisher, contact us by completing and submitting the form below. If you are looking for a specif part number, please include it with your message.